To nurture students into becoming strong leaders, representative of all the core values of UNCW, through the maximization of professional global competency, Hispanic cultural and linguistic representation, and leadership through cultural identity development. Centro Hispano serves as a link between students and all available resources needed for their academic growth, as well as for their development as future professionals. 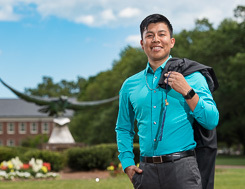 The goal of Centro Hispano is to support the rapidly growing number of Hispanic students applying, attending and completing degrees at UNCW. We promote opportunities that broaden understanding and appreciation of diverse Hispanic cultures, offer resources that maximize the success of each student, and most importantly, providing a place where every student feels at home while striving for success. In 2005, Centro Hispano originated through the efforts of a distinguished faculty member who saw the need to increase diversity on campus, particularly the Latino demographic. At that time, Centro Hispano had no budget, office or staff. Today, Centro Hispano serves more than 1,000 Hispanic/Latino students who attend UNCW, and serves as leaders in the local Latino community through mentoring programs, cultural events and community engagement.